Sean McGinley is a Licensed Real Estate Salesperson working alongside top performing brokers Jarrod Guy Randolph and Kevin Geloso. Well-versed in providing pertinent market information and personalized marketing strategies, Sean’s passion for real estate and attention to detail keep him ahead of the curve when it comes to every aspect of a deal. Prior to joining Compass, Sean most recently worked as the Director of Research and Marketing Strategy for a leading boutique brokerage firm. Additional previous experience includes years of residential and commercial brokerage, consulting, and advisement. His responsibilities included international development reporting, as well as overseeing a $150 million portfolio of residential condominium assets. 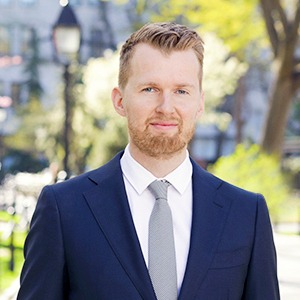 Sean received a Bachelor in Business Management and Entrepreneurship from Baruch College with a concentration in Real Estate, and he sits on the Executive Committee for NYRS (New York Residential Specialists). In his spare time, Sean enjoys discovering new eateries and attractions throughout New York City, playing basketball and running. He now resides in Brooklyn.